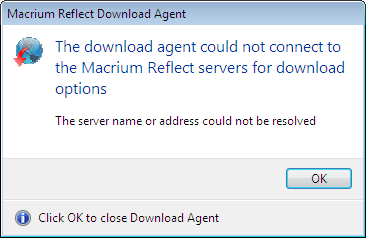 Macrium Reflect requires an Internet connection to download installation files, check for and download updates, and to build the Windows PE rescue environment if required files are missing from your installation. If you have problems with this process due to Internet connection availability but otherwise your connection appears fine then the most likely cause is that your Anti-Virus software has blocked access using application based firewall rules. 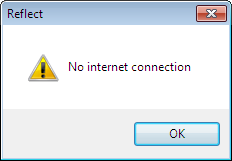 Usually, the first time an application attempts to connect to the Internet you will be prompted to allow access by your AV software or sometimes Internet access may be just denied. In all cases, if your Internet connection is otherwise working correctly and you can access http://www.macrium.com from your web browser, then to allow Reflect to access the Internet, it's necessary to change settings in your Anti-Virus software. Anti-Virus settings can vary greatly between different vendors and between releases of the same software so it isn't practical to attempt to list the numerous way of unblocking AV software in this article. If you are unable to do this then you'll need to visit your AV software vendors web site or use Google for more information.